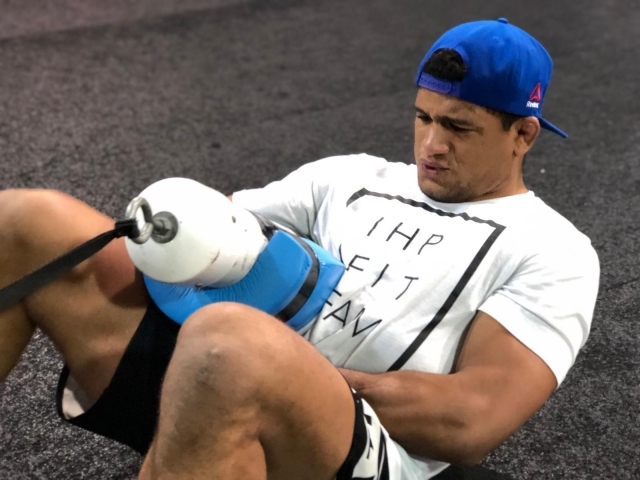 UFC fighter and BJJ black belt world champion Gilbert Durinho Burns has a unique approach to developing that squeeze in Jiu-Jitsu: Static Guillotine workouts. It’s simply THE VERY BEST investment of your time and energy for BJJ strength training. If you want to get stronger immediately for BJJ, this is the program for you. 1. It uses very little time – from as little as 3 minutes to 12 minutes at the most. You can’t beat it. 2. It uses very little energy. You will not feel drained at the end of it. You can even do it after a hard BJJ training session. 3. It has DIRECT sport specific benefits. These are sport specific movements, so you will feel the obvious strength gains when you roll. 4. It’s very safe. You won’t pull a hamstring, you won’t tweak your back, shoulder or knee. You won’t get sidelined from training with an injury. How often do you hear someone is “mat strong”? Often this means that the person may not be able lift impressive weight but has a functional strength while grappling. While body mechanics and leverage help assist with “mat strength”, I believe this person will have a high ability to isometrically resist an opponent. Grappling is often a game of inches as two opponents battle for positions and specific areas of control. Isometric strength is the ability to maintain a resistance against an unyielding force. When it comes to grappling it is not necessarily that someone is strong isometrically, because this just means they are only strong at one specific range of motion (+/- 10 degrees) but they have the ability to isometrically ramp and recruit more motor units for their desired task when necessary. The ability to isometrically ramp is critical for developing efficient choking skills, this is something @eddiebravo10 calls “The squeeze”. How often do you see beginners get a choke and squeeze as hard as they can and burn out before getting the submission? Here is an example of Eddie teaching how he developed his squeezing power but using his knee to simulate an opponent. The clearest example of teaching isometric ramping was @jamesdriskill, black belt under Rickson Gracie. He explained that when applying a choke you start with a 10% contraction, then bump up to 20%, then to 30% and so on. Usually by the time you are contracting/squeezing at 40% maximum they tap or fall unconscious. What he is describing is slowly ramping up activation of the motor units in your arms so that you can continuously apply pressure without exhausting your muscles. Isometric ramping is a skill many grapplers develop unconsciously over time, however if you feel you lack the control it is an important aspect to address. It is very demoralizing when you are in the perfect position to finish an opponent but lack the muscle control to finish because your arms burn out.